Please call us at 850-453-3281 if you don't see the appointment type or availability you are looking for. 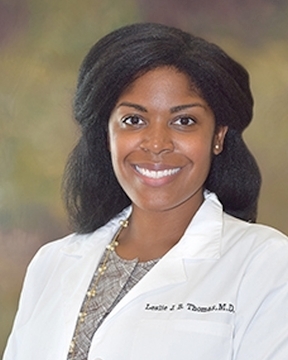 Dr. Leslie Thomas earned a medical degree from the Medical University of South Carolina and completed residency training at St. Vincent?s Family Medicine in Jacksonville, Fla. She is board-certified in family medicine. Dr. Thomas has special interests in women?s health and pediatrics. She also performs ... Read More small procedures, such as injections and cryotherapy. In her spare time, she enjoys reading, traveling on mission trips and cooking. Dr. Thomas is married with three kids.